Japan might not look so large on a world map, but at ground level there’s a huge amount of variety. For some, the country shines brightest in the dazzling lights of Tokyo, while others find their slice of heaven in the quiet traditions of Kyoto, the boisterous comradery of Osaka or even farther afield in charms of the Seto Inland Sea or Yamaguchi. 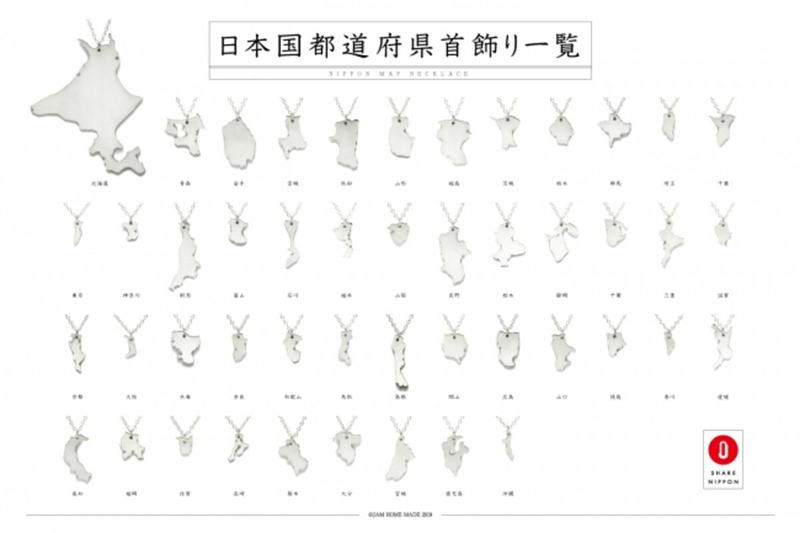 The Nippon Map Necklace series (nippon being one of the ways to say “Japan” in Japanese) starts with a single piece of silver, from which artisans cut a map of Japan’s four major islands—Hokkaido, Honshu, Shikoku and Kyushu, as well as Okinawa. Then those pieces are further split into the country’s 47 prefectures, with each then placed on a chain to be worn as a necklace. Because they start as a single map, the individual prefectures are to scale, with Hokkaido (left) much bigger than Kyoto (right) in the photo below. In the photo below (from top to bottom, left to right) we have: Tokyo, Kyoto, Osaka, Kanagawa, Nagano, Nara, Kagoshima, Oita and Okayama. Of course there are many, many more! Each piece is hand-crafted, currently priced at ¥8,262 (about US$74), and can be ordered through Jam Home Made’s online store.